The command \catcode`\ =12 changes the category of the space character to "Other". This will make TeX display it. The space glyph in a typewriter typeface looks familiar. However, the glyph shown in the default typeface I don't recognize. Out of curiosity, does it have a name? And what is it used for? Since the character has width 0.277779pt, when it comes before a lowercase "l", its width is compensated for. In the cmtt10 font (and the other typewriter type fonts), the slot is filled with a "visible space". It looks like the slash on U+2422 (BLANK SYMBOL): ␢. 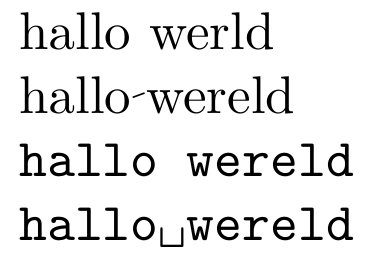 Since LaTeX has been known to overlay slashes on regular characters (e.g., the symbol produced by \hbar), I bet the underlying b was erased or omitted. Not the answer you're looking for? Browse other questions tagged symbols plain-tex naming or ask your own question. What symbol is this (sample space)? Does anyone know the name of this symbol?